In a food processor, pulse the bread with the parsley, cayenne, Old Bay and baking powder until fine crumbs form. Transfer the crumbs to a medium bowl. In a small skillet, melt 1/2 tablespoon of the butter. Add the red bell pepper and shallots and cook over moderately high heat until softened, about 3 minutes. Let cool to room temperature, then transfer to a large bowl. Add the eggs, parsley, Worcestershire, Old Bay, mustard, cayenne, baking powder and salt and stir well to blend. Add the crabmeat and the bread cubes to the bowl and toss gently until evenly combined. Form the crab mixture into 24 small patties, using 1/4 cup per patty. Squeeze to wring out any excess liquid. Roll the crab cakes in the bread crumb coating and arrange them on a large rimmed baking sheet. Cover with plastic wrap and refrigerate for at least 1 hour, until thoroughly chilled. In a large skillet, melt the remaining 2 tablespoons of butter in the olive oil. Working in batches, cook the crab cakes over moderately high heat, turning once, until golden brown and crisp, about 10 minutes per batch. 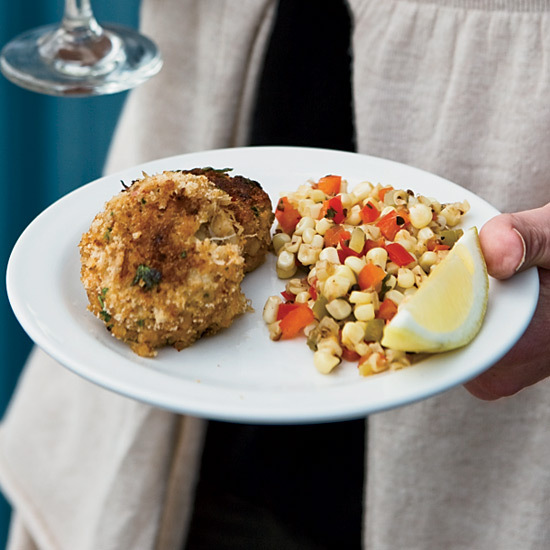 Serve the crab cakes with lemon wedges. Crab, like other rich shellfish including lobster and scallops, is a natural partner for ripe, full-bodied white wines. Chardonnay from California's Monterey AVA doesn't get as much attention as bottlings from Sonoma or Napa Valley, but the region's cool ocean winds and bright sunshine produce a lot of good wines.